Go long range fishing! You will see things you have never seen before and which very few other people ever will. You will be living on the ocean, at times eating fish caught that day or cured for a sushi feast. You will learn that yellowfin tuna and wahoo can both fly. You will discover that in an endless expanse of sea, pillars of volcanic rock can emerge; a cavalry charge of 200-pound bluefin tuna froth to the surface. Long range trips aren’t just a way to fish, they are a way of life. 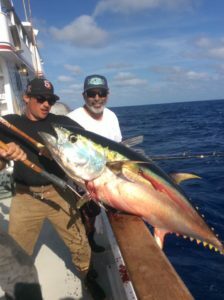 While the trips made by the late Bill Poole ran from San Diego to Guadalupe Island are generally considered the first long range runs, destination and distance only partly define long range fishing. There is no hyphen in the term long range. Perhaps the words should be capitalized, even enshrined, given a glow and a drop shadow. That’s not necessary. All that is necessary is that one day you step aboard a long range boat that is headed out for 3, 5, 6, 7, 8, 9, 10, 11, 12, 15, 16, 18, 19 and even 22 days (it happened) and really find out what long range means. The “heart and soul of long range” resides in San Diego, although it is not unusual these days to travel to a port town below the Mexican border and board a long range vessel. Really, though, a true long range boat calls San Diego home. Long range boats were built for long range trips. 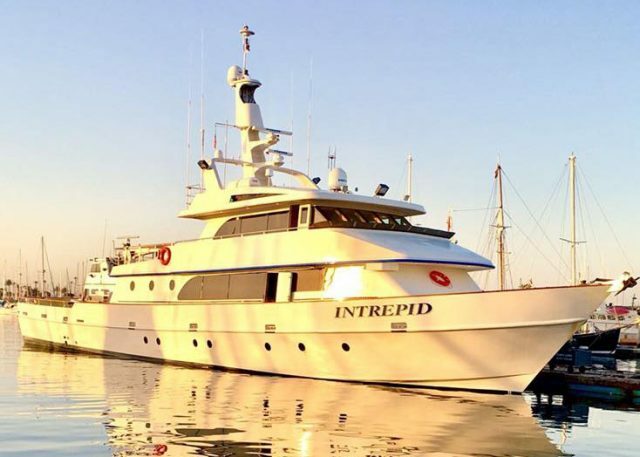 There are other sportfishing boats that can fish the same areas long rangers go, yet they belong to another class, whether that be a super yacht or a sport boat with bunks, galley and a fish hold licensed and able to travel a couple hundred miles. That said, the first shower on one of Poole’s boats was a deck hose. 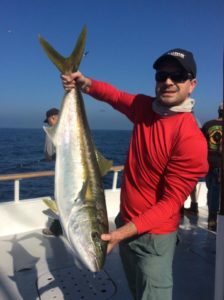 Insane yellowtail fishing at the ‘Lupe might have been enough at first, but competition between the operations of Lee Palm and Bruce Barnes fueled by the needs and desires of customers, quickly drove long rang fishing to another level. Now Wi-Fi is common and fish processing procedures rival those used by the highest quality commercial operations. Decades ago air-conditioned staterooms with sheeted beds replaced bunks, while, ironically enough, hot showers in multiple heads might be the one common thread found in all true long range boats. And the endless parade of fine meals and snacks is a tradition that goes way back, while satellite TV and internet are fairly recent additions. For years customers have been bringing aboard their own favorite beverages and that, too, has expanded to cases of fine wine and cigars. “We can’t control the fishing, but we can control everything else,” was how the legendary Poole summed up his philosophy. Ah yes, the fishing. You can find adequate to luxurious “oceanfront” accommodations in many places around the world and also find good to fantastic fishing on boats that leave from the local harbors. You might even stay out a night or two on a mothership operation, which bring along smaller boats to fish from. But nowhere will you find a fleet that rivals the long range boats out of San Diego – or the fishing. 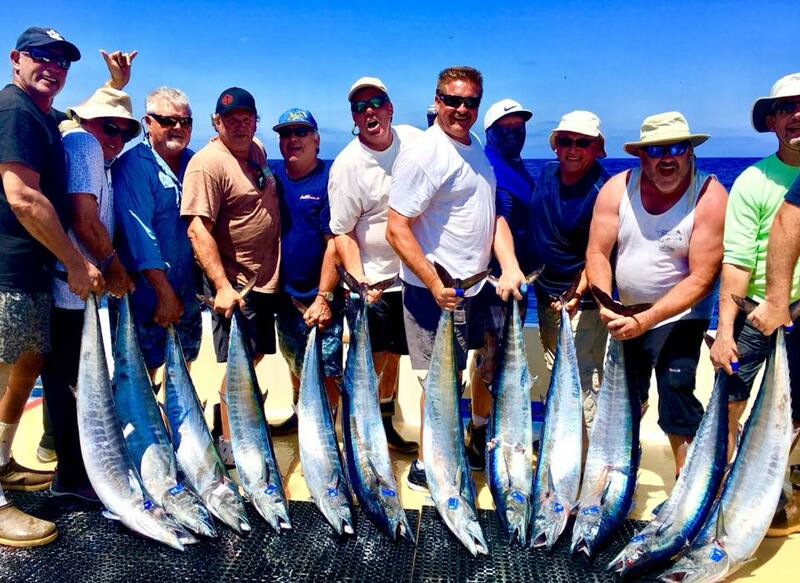 Simply put, you are fishing 24 hours a day for tuna, yellowtail and wahoo. Fish like dorado, marlin, seabass and grouper are a bonus. Literally thousands of square miles of ocean straddling the Tropic of Cancer and stretching lengthwise along the Pacific Rim of Fire provide the fishing grounds – an immense array of volcanic islands, spire-like remnants, atolls, fracture zones, banks, seamounts, high spots, drop-offs, reefs, bowls, points and bluffs. These structures are home for many, many big fish. 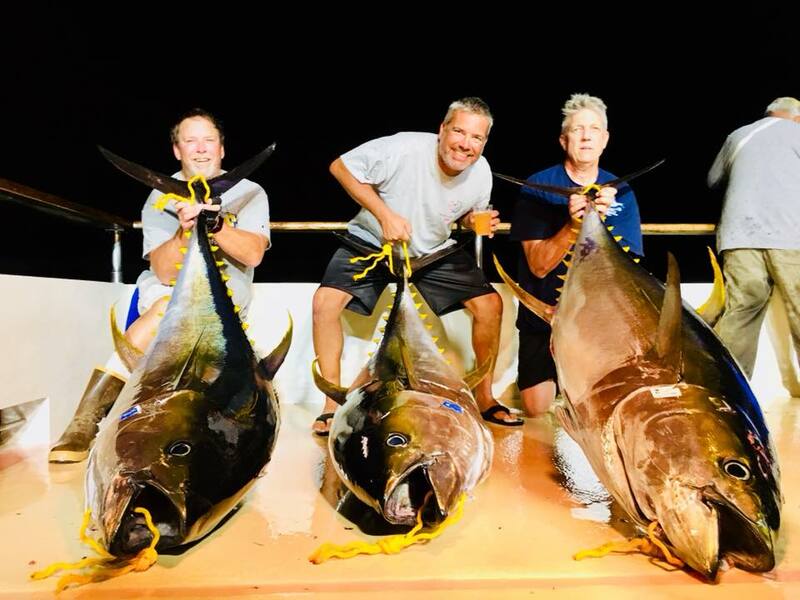 This is the home of the world-record yellowfin tuna, with a growing number of 400-pound-plus yellowfin taken and innumerable 300-pounders decked. Wahoo may get as big elsewhere, yet they school up in vast numbers unlike anywhere else. 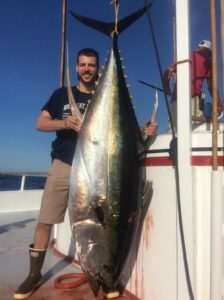 Only a freak yellowtail catch in Japan competes with the huge yellows that dot the record lists and were caught in locations like Guadalupe Island and Alijos Rocks. Location, location, location. 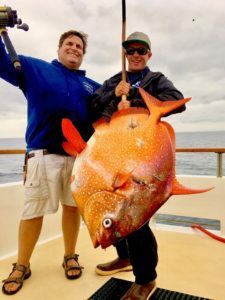 This writer’s first long range trip, a 3-day on the Red Rooster III, ran north out of San Diego to the San Juan Seamount in search of albacore, found only a couple fish and a huge swell, turned around all the way to Punta Pescadera to scoop up live squid, only to the end the trip catching yellowtail at the Coronado Islands on tube mackerel in the tank from a previous trip to Guadalupe. 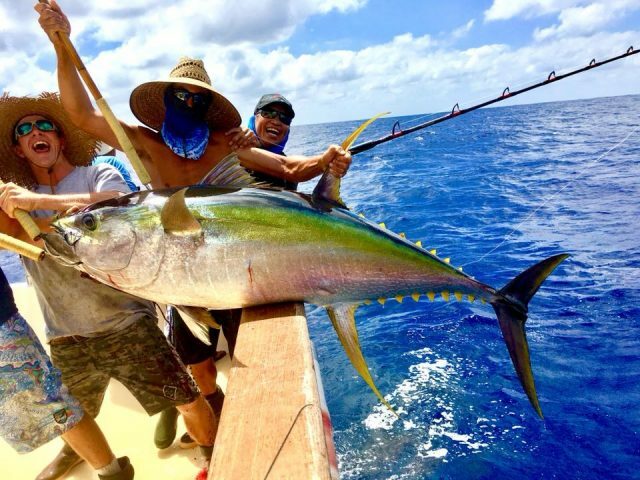 The second, a 5-day, fished Cedros, Benitos and Guadalupe, while the third and fourth trips ran to Alijos Rocks. The fifth left out of Puerto Vallarta, made bait at El Banco and Benedicto and then fished Clipperton Atoll. The location list goes on – Clarion Island, Roca Partida, Tanner Bank, San Martin Island, Geronimo Islands, Cortez Bank, Mushroom Bank, 60 Mile Bank, San Clemente Island, Socorro, San Benedicto, the Potato Bank, the Jaime Bank, Alijos Bank, the 23, the Ridge, Chester’s Rock, Clam Bay, Asuncion, Natividad, the Ranger Bank and many more visible only as marks on a chart. Once we fished on a dye mark dropped by a bluefin spotter plane with the permission of a seiner still an hour away. The heavy majority of the spots mentioned above are in Mexican waters, offshore of Baja California. A laudable conservation ethic on both sides of the border has led to the creation of marine conservation areas and sanctuaries as populations and development continue to expand throughout the Californias. Leaders in the sportfishing communities in both nations are working hard to keep access to fisheries open for the sustainable efforts of recreational anglers. Meanwhile, these are the good old days. There are no guarantees when it comes to fish deciding to bite. What is guaranteed is that the captains of the modern long range fleet have the knowledge, the crew and the tools to put you where the big fish live and in the middle of the action. Another guarantee is that the tackle available to fishermen has never been better, and a lot of the credit for that innovation goes to the long range fishermen and the tackle manufacturers with deep roots in Southern California who accepted the challenge to develop methods to both hook fish and then get them on the deck. Soon, they will all come together at the Fred Hall Fishing Tackle and Boat Show. This is the place to book your next trip, see the latest tackle and check in with old friends to plan a new adventure. And there is no adventure like a long range trip. Outdoor journalist Rich Holland has spent his life chasing the next bite.